H&M is dramatically behind schedule in correcting the dangers faced by the Bangladeshi workers who produce its clothing, according to a new report by Clean Clothes Campaign and others. According to data from factory inspections publicly disclosed by the Accord, (an agreement signed by H&M in the wake of the Rana Plaza disaster which killed 1138 workers in 2013), strategic H&M factories are not safe and H&M has failed to honour promises to repair and improve their conditions. Focusing on the subset of contract factories that H&M has deemed the best performers in its supply chain on labor and environmental issues, the report shows that all of these factories have failed to meet mandated timeframes for repairs and the majority of all renovations have still not been completed despite lapsed deadlines. 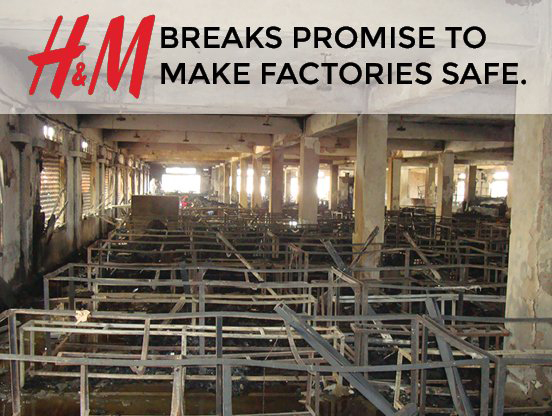 If only H&M was willing put the same energy into actually meeting their much lauded sustainability commitments as they do into promoting them, we may well be closer to seeing a safer garment industry in Bangladesh. The outstanding renovations include the installation of fireproof doors, the removal of locking or sliding doors from fire exits, and the enclosure of stairwells – meaning that in many factories workers may be unable to safely exit a factory in an emergency.